Description: I love that ad, "The ultimate off-road vehicle". Description: New Jersey Transit prepares for the afternoon rush. Description: NJT "Geep B" 4146 leads yet more great comet 1s off the main line into WJ. Description: A passenger engine being used for MOW laying over at Far Hills on the passing siding waiting for the night crew to take her back east. Description: NJ Transit GP40PH-2 #4146 pulls GP40PH-2B #4209 and 3 passenger cars through the Long Branch train station with a fueling move. Description: Here is an away shot of the 2 locomotives in the Non Revenue move going through Long Branch with train X233. Description: NJ Transit GP40PH-2 #4146 with GP40PH-2B #4209 laying over in Bay Head Yard with another Non Revenue Move. The train would return to Hoboken at Midnight that evening. Description: NJ Transit GP40PH-2 #4146 lays over in Hoboken Terminal with a solid Comet 1B Consist. 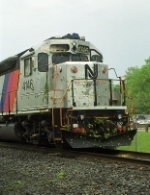 Description: This NJ Transit diesel collided with a fallen tree after storms tore through northern New Jersey. Description: A damaged number board and head light is the extent of the damage to this unit after hitting a fallen tree. Description: NJ Transit employees check out the damage caused when the train struck a fallen tree. Description: NJ Transit GP40PH-2 #4146 pulls into the South Amboy Train Station. Description: Here is a photo of NJ Transit GP40PH-2 #4146 and its consist. Description: NJ Transit GP40PH-2 #4146 pulls its train through oceanport NJ. Description: NJ Transit GP40PH-2 #4146 waiting for passengers to board at the Red Bank Station with a 3 car train. Description: A closeup of 4146. Description: NJ Transit GP40PH-2 #4146 pulls F40PH-2CAT #4125 through Little Silver NJ hauing train X233. Description: Various power sits in the fresh snow at the east end of the loco shop at the MMC. Description: A New Jersey Transit GP40PH-2 behind the MMC. Description: Assigned to the yard shoved in the middle of 2 passenger cars. Description: A closeup of NJ Transit GP40PH-2 #4146. Description: A view of all the locomotives in the yard. Description: NJ Transit GP40PH-2 #4146 pushes some of the passenger cars.